“Our vaccines are contaminated with an herbicide that the World Health Organization characterized as “probably carcinogenic to humans.” How can this happen? That answer is easy. Many vaccines contain animal byproducts such as gelatin, bovine casein, bovine serum, bovine calf serum, or chicken egg protein. The animals from which these products come from are fed grains sprayed with glyphosate. It does not take a rocket scientist to come to the conclusion that these animals, fed glyphosate in their diet, would contain glyphosate in their byproducts.” More Shocking Vaccine News: Common Vaccines Contaminated with Glyphosate! Is Bill Gates a Psychopath? Gate's steepling his hands and smug smile is showing he is very confident about something. Is he sure that he is so much smarter than us that he and his powerful friends can mass murder us in plain sight.? “Look at the levels of Formaldehyde and Glyphosate IN the corn! The EPA standards for Glyphosate in water in America is .7ppm. 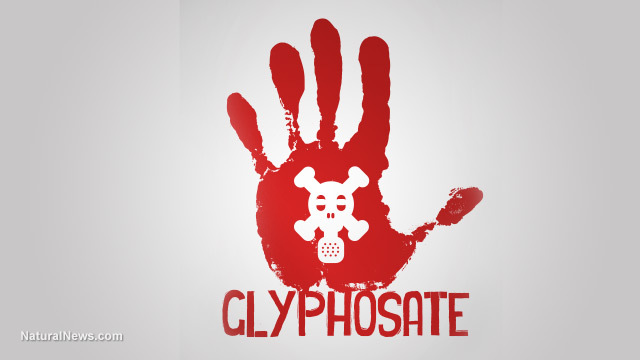 European Tests showed organ damage to animals at .1ppb (.0001ppm) of Glyphosate in water. Our water levels allow glyphosate 7,000X higher than what has been shown to be toxic in animals. This corn has 13 ppm! 130,000 times higher than what is toxic in water! *” Stunning Corn Comparison: GMO versus NON GMO . Note this answers the mystery of how MANY animals can tell GMO is toxic and will not eat it. They can SMELL the poisons Formaldehyde and Glyphosate ! 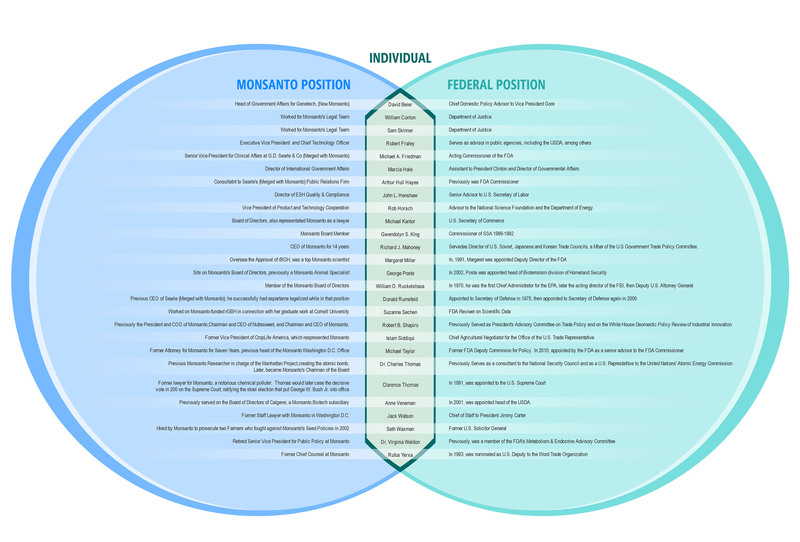 Jeffrey M. Smith interviews Researchers Doctor(2x) Stephanie Seneff and Doctor(3x) Alex Vasquez on the broad dangers of Monsanto’s GMO and Roundup with Glyphosate. This is a somewhat complicated discussion. BUT it is terribly important to your health that you come to understand it in the end. Each time through you will pick up some more important material. You will learn much about basic mitochondial operation. So many KEY aspects of your health are covered and related to each other. PLEASE keep at it. Of course the key point is you MUST avoid GMO “foods” and Monsanto’s Roundup and other Glyphosate Fertilizer Poisons. This discussion tells us the dozens and dozens of reasons why this is so. 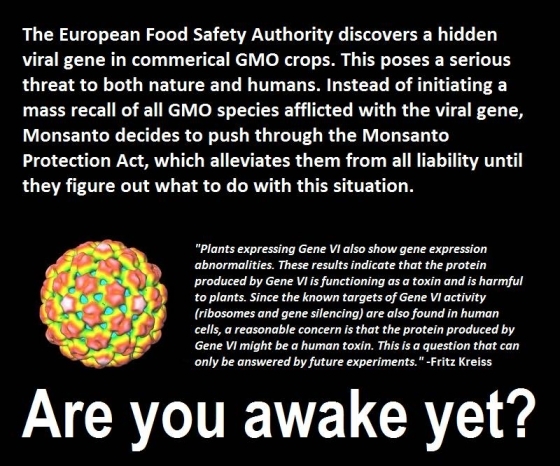 IMO GMO is turning out to be a very important biological weapon being used on the human race. Simple Rule that holds for all of health. "If man made the "food" you cannot eat it." Is the USDA silencing scientists on GMO truths?! Folks do you really need MORE than this? Please STOP eating the Deadly GMO crap. We CANNOT be less intelligent in our choice of food than most animals! Note: Not can cause but IS CAUSING. We have THOUSANDS of instances of this damage. Protein coding genes are OBVIOUSLY being damaged. Animals can sense this damage. Well intelligent animals. Are humans intelligent animals? This is being decided now. If we as a species accept our poisoning by elite and politically protected human criminals you can make a good case the deer who will not accept GMO crap as food are our intellectual betters. "It is increasingly evident how dangerous genetically modified food is. The American Academy of Environmental Medicine has recently called upon physicians to inform their patients about the list of health dangers involved with GMOs. After many studies and tests of GM foods fed to animals, scientists reached the conclusion that there is a direct relationship between GM foods and disease. The health of Americans is deteriorating at an astounding rate, and upon reviewing over six hundred scientific journals, world renowned biologist Pushpa M. Bhargava claims that GMOs are a major factor in the issue." "In May, the American Academy of Environmental Medicine concluded that animal studies have demonstrated a causal relationship between GM foods and infertility, accelerated aging, dysfunctional insulin regulation, changes in major organs and the gastrointestinal system, and immune problems such as asthma, allergies, and inflammation." GMO Genetically Modified Organisms are “foods” which have had their genes modified by man. Your body does not recognize GMO "foods" as food and all kinds of bad things happen when you eat this poison. Rats fed GMO were unable to reproduce in five generations, hamsters in three generations. Just the thing to lower the world's population. Sugar beets are GMO and sugar is 25% of our calories. Folks what the hell is happening? It should be obvious. GMO ALERT: 8 Beers You Should Stop Drinking Immediately! Did you know that about 70% of the foods in your grocery store contain genetically modified foods? This is because about 70% of the fat and over half the protein in processed food is made from soy and almost ALL soy is GMO. Most, 95%+, corn is now GMO. These unlabeled genetically modified foods, usually Processed Foods carry a risk of life-threatening allergic reactions. IMO GMO foods, like much of our food supply, are just another depopulation tool. The book “Seeds of Deception”, by Jeffrey Smith explains how genetically modified foods cause health problems, and their potential for creating a vast array of unforeseen and surprising illnesses. He also sheds light on how the corruption within the U.S. government, the FDA, and the GMO industry has allowed, and perpetuated, the cover-up. IMO the people who own our "government" want a world population of about 500 million, it is just that simple. There is no other good explanation for the actions of the FDA and the "congress" which is supposed to "regulate" the FDA. 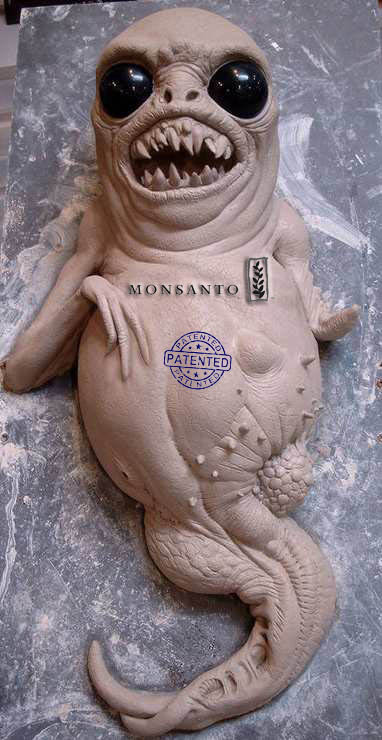 Click to see how Monsanto Controls our "Government"
When you hear the term "Gene Splicing" you naturally think of a precise operation undertaken with extreme care. This is false. The actual technique consists of shot gunning millions of the genes into millions of genome targets. A few of the resulting genomes will have the gene inserted BUT how many of the thousands of other genes in the genome will have been damaged by the shot gunning process? From the catastrophic results we see it is probably MANY, at least in the hundreds IMO. How could such a disastrous process have been approved? The approval was pure POLITICS folks. The politics of depopulation genocide IMO. “All the ASEAN countries, and Australia, produce papaya. It is a popular fruit, and exports to non-producing countries are increasing. It provides a cheap source of several vitamins and minerals. However, like most tropical fruits, papaya ripens quickly after harvesting and will then rapidly deteriorate and succumb to diseases. It is liable to soften and spoils easily. It is also sensitive to low temperatures and so cannot be stored in cool conditions. Hence, transporting the fruit within a country - let alone exporting it - causes large losses. Up to 40% of the harvest is lost in transit from the farmer to the consumer. Folks is this not enough for you. It is for me. Farmer feeds GMO corn to his pigs: they all become sterile. Maybe the GM soy will solve the overpopulation problem. Please read the article referenced by the above quote. It explains the FORCED prostitution of science to the GLOBAL overarching political drive to reduce the world's population by contamination of the world's food supply. Now think about the contamination of "our" food. Do you think our rulers are eating this crap? Not on YOUR life! The FDA does not test GMO foods but allows Monsanto, the CIA et al presumably to do the "testing". The FDA says it can see no difference between GMO and real food. Folks a rat with an IQ in the single digits can tell the difference. The FDA is IMO a rat, and it KNOWS the difference. 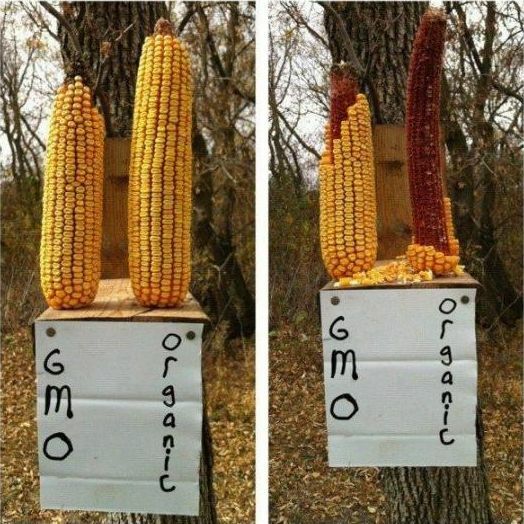 Even squirrels know to avoid GMO! 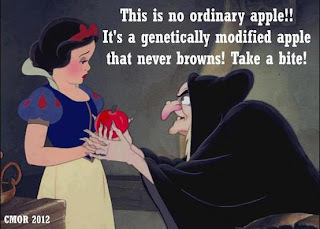 Our Kids are getting GMO Toxins in almost EVERY "School Meal" Yet another advantage of Government Schools. 95% of soybeans in the US are GMO. Please say goodbye to soybeans until we get an honest government at least. Unless you KNOW the soybeans are organic NON-GMO and FERMENTED you are foolish to eat them IMO. 95% of corn is GMO. Please say goodbye to corn until we get an honest government at least. Beet sugar is now GMO. This makes total avoidance of sugar IMO imperative! Beet sugar being cheaper than non-gmo cane sugar is used in the cheap processed foods as a cheap sweetening filler, oops I almost said KILLER. You can see the problem we have with GMO sugar. The average person eats 25% of his calories as sugar. I am afraid if you do that now you will live much less than the three or four decades it used to take sugar to kill or seriously maim you.